Higher education marketing agency Austin & Williams announced the launch of a new advertising campaign for Metropolitan College of New York (MCNY). This campaign is Austin & Williams’ first for MCNY since the Long Island-based agency was awarded the account in March 2015. Intended to differentiate MCNY from other schools by positioning it as the college of choice for experience-based learning and applied scholarship, the campaign was created as a result of extensive market research with current and prospective undergraduate and graduate students. “Our creative platform disrupts the higher education category conventions of featuring aspirational students and sprawling campuses to focus on the tangible social outcomes and neighborhood-serving achievements accomplished by MCNY graduates,” says Rick Chiorando, principal and chief creative officer at Austin & Williams. Each execution showcases how a graduate—and more importantly, a community—benefit from the student’s degree, from creating a safe haven for the elderly and encouraging lifesaving minority bone marrow donations for children to providing financial mentoring and independence for those who could not otherwise live within their means. The campaign poses the question “What’s Your Purpose?”—a declaration of MCNY’s core Purpose-Centered Education curriculum, which is based on the belief that students learn best when they understand the “purpose” for their learning and see the connection between what they learn in the classroom and their ability to change their lives and the lives of others in a positive fashion. The fall campaign launches with a media mix consisting of streaming video and audio, print, out-of-home, digital display and social media, as well as partnerships with state agencies and organizations. 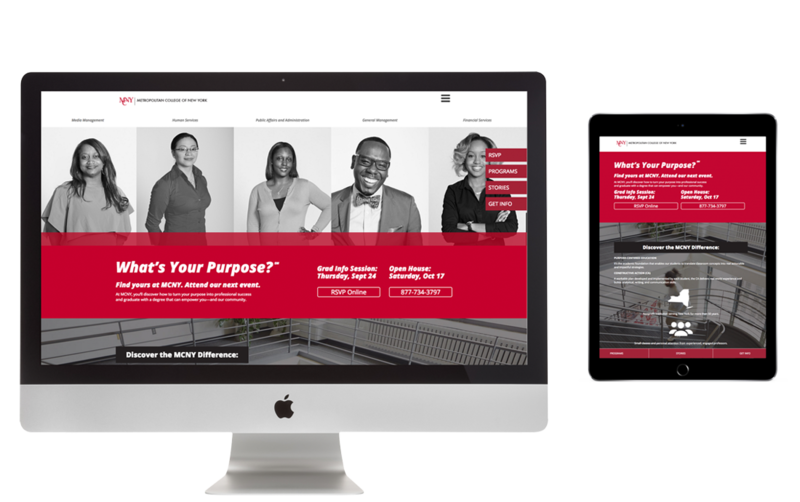 All communications drive to www.WhatsYourPurpose.nyc, a responsive, content-rich microsite featuring upcoming open houses and graduate info sessions, undergraduate and graduate degree programs, and compelling stories of MCNY graduates and the communities they have helped. About Metropolitan College of New YorkMetropolitan College of New York (MCNY) is a private, independent, not-for-profit institution of higher education with locations in lower Manhattan and the Bronx. The college is chartered by the Board of Regents of the University of the State of New York and accredited by the Middle States Association of Colleges and Schools. MCNY is approved for the training of veterans and other eligible persons by the New York State Education Department. Formerly Audrey Cohen College, MCNY was founded in 1964 and is comprised of three schools offering undergraduate and graduate degree programs: Audrey Cohen School for Human Services and Education; School for Public Affairs and Administration; and School for Business. MCNY’s mission is to provide a superior, experience-based education that fosters personal and professional development, promotes social justice and encourages positive change in workplaces and communities. For more information about MCNY, visit www.MCNY.edu.